Sakura Matsuri Returns to Pennsylvania Avenue on April 14, 2018 – The Japan-America Society of Washington, Inc.
WASHINGTON, D.C. – The 58th Sakura Matsuri – Japanese Street Festival, a Premiere event of the National Cherry Blossom Festival and America’s biggest one-day Japanese festival, will be returning to its much-loved Pennsylvania Avenue location in 2018. Held between 3rd and 7th Streets NW, the Sakura Matsuri brings another year of vibrant cultural celebration to downtown Washington D.C.The festival is open from 10:30 a.m. to 6:00 p.m.
Every year the festival draws tens of thousands of visitors from all over the world for the exciting performers, authentic tastes of Japan, and unique vendors. In 2018, the festival welcomes many returning favorites, such as the shamisen prodigy Keisho Ohno, the Tamagawa University Dance and Taiko Group, chart-topping singer-songwriter Kana Uemura, and folklore-based rock band Kanadete sourou. Kirin Beer and Hakutsuru Sake will also be returning to support the festival. The Culinary Arts Pavilion will feature new panelists this year to invite festival guests into the world of Japanese cuisine on a deeper level that goes beyond just sushi and tempura. Yoshitaka Nishino of the Matsukawaya wagashi shop chain – which now has a location in Washington D.C. and has become a staple of the area – will return to demonstrate how Japanese confections are made. 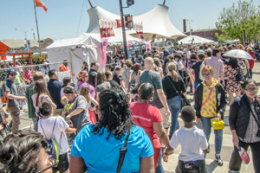 The Sakura Matsuri prides itself on being a festival that is fun for all ages, which is why our yearly Children’s Corner is so widely attended. Families enjoy hands-on educational and cultural activities for children encompassing different themes of Japan, from trains to musical instruments. JR Central will be in attendance for another year, showcasing Japan’s strong technology innovation with models of the maglev train. Young adults can also enjoy their own slice of modern Japan at the Japan WOW! Pavilion, which hosts a variety of games, attractions, and J-pop performances throughout the day. The festival will charge $10 for visitors who are 13 years of age and above. Children 12 and under are free. Tickets are on sale online at www.sakuramatsuri.org, or can be purchased with cash on the day of the festival. For more information regarding the Sakura Matsuri – Japanese Street Festival, please contact March Hitzig with the Japan-America Society of Washington DC at mhitzig@jaswdc.org or call (202) 833-2210.